Seaport Sertoma is honored and proud to present John Downer, Jr.
John Downer, Jr. was born the youngest of 11 children in Plant City, Florida. When he was two years old his mother passed away. Several years later his father remarried and his family moved to Tampa. John grew up idolizing his dad. He remembers his father as a dominant and caring person to whom his family and the community could turn to for strength and leadership. Too soon John’s world was turned upside down, when at the age of 12, he lost his dad. John went on to graduate from Tampa Bay Tech in 1986. He vowed to move from Florida and start a new life. He joined the U.S. Navy, and after boot camp, found his seagoing home aboard the USS TARAWA (LHA-1), based in San Francisco, California. He was deployed to the Persian Gulf during the Gulf War and served alongside some great shipmates, many he considers family to this day. It was while in San Francisco that he became a lifelong San Francisco 49ers football fan, which would become much more relevant in his life. After his tour in the Navy, John worked on Governor Bill Clinton’s first Presidential election campaign in San Diego. He also worked on countless other political campaigns, but things in his life were troubling. He entered into a prolonged period of depression and homelessness. Eventually he moved back to Florida and sought help through Veterans Affairs. As his life improved, he met his soon to-be wife, and he found employment at the Hendry shipyard, where he has remained since 2008. He renewed his commitment to once again reach out and help others. He donated his time to various VA events that supported disabled veterans, including working countless hours at the James A. Haley VA nursing home. In his current position as Safety Manager at Universal Environmental Solutions, he continues to excel in leadership and dedication. His passion for the San Francisco 49ers never wavered. He was soon involved in their community outreach program, “NINER EMPIRE.” There are 150 chapters nationwide. Besides game day celebrations, they donate time and resources to numerous local community organizations. John is currently President of the Tampa Bay Area Chapter, 25 members strong and growing. In his service to mankind locally, John and his fellow chapter members, along with employees of Hendry Marine Industries have served over 200+ homeless at Trinity Café, also donating clothing and toiletries. He continues to donate numerous hours working with fellow veterans at the VA. By helping others, and giving back to his community, he continues to honor the memory of his father. 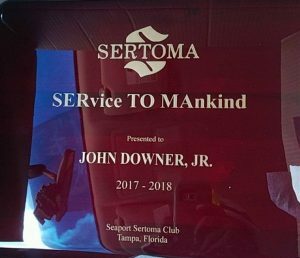 John Downer, Jr. is Seaport Sertoma’s Service to Mankind Recipient for 2017-2018, and a nominee for the Central Florida District Service to Mankind Award. We believe John exemplifies the true spirit of the next generation – Community Volunteer. Someone who gives of himself, from the heart with openness and compassion, and without regard for personal gain or accolades. We are a far better community because of John and the compassionate leadership and outreach he has provided. It is this spirit and drive that Seaport Sertoma believes will carry him as the Sertoma Central Florida District’s Service to Mankind representative, and he will become the outstanding candidate and recipient at the Southeast/Caribbean Region and on to the National level. Congratulations John on this well-deserved award!